We can understand in Gen; 1:10, that God had already given the name Earth to our Planet and that Eden was a land area focused on God’s point of view. Since our histories of the old known world are focused around the Mediterranean and also that Havilah and Ethiopia are mentioned, we would conclude that God was facing the Continent of Africa, which would then contain the district of Eden at the eastern side. This of course compliments our archaeological studies and also maps that portray the region of Havilah around Ethiopia. Geology will also tell us that Gold is most resourceful in Africa where Onyx stone and Bdellium are also found and that Cush was also a name given to eastern regions of Africa in the northern parts of the Sudan. Generally, Havilah is translated as “stretch of sand” which we can compare to the eastern side of Africa and Egypt like Saqqara or the Sudan. I have also revealed that Avila is actually the real word disguised between the letters h and that in antiquity the V interchanges with F and L with K that gives us the name of Africa from Afika having evolved from Avila. The comment in Gen;2:11 of the Pison river encompassing the “whole land of h-Avila-h” is telling us of a River that flowed throughout all of Africa while the Gihon flowed throughout Ethiopia which is also a district of Africa. The Pison is also mentioned as being the “first” river and the Gihon as the “second” river, which also identifies that this river originates in Africa. Herodotus in his Histories Books also tells us that the Nile River once flowed westward towards the Pillars of Hercules so named for the Straits of Gibraltar that feeds the Mediterranean Sea from the Atlantic Ocean. (Oceanus and Tethys in Greek Myths) The Hiddekel and Euphrates would then also be two of the four heads that separated from the Nile and flowed out across the Red Sea to Asia in antiquity. When we realize that Avila is the Continent of Africa and that Eden is a district on her Eastern side and that the Nile was the main River of four heads that parted out of Eden, then we only need to look at the source of the Nile for our Garden “of” Eden. This is Lake Victoria, which is the largest freshwater Lake in Africa and one of the largest on the Earth. The Lake of Victoria would then be equated with the biblical term for “fountain of the deep”. The lands around Lake Victoria would then have been the district of Eden and somewhere eastward in Eden we should find our Mystical Garden of God’s Creation for Adam and Eve. As revealed before you and as these photos also provenance, we can find our Garden of Eden in Tanzania near the Ngorongoro Crater and the Serengeti valley that thrives with an abundance of diverse wildlife. From the air, the district of the Ngorongoro Crater with it’s lakes appears as if a giant Phoenix bird flying through the air. The Mystical Phoenix bird is said to appear in Egypt only in periods of 500 years from a long flight in Asia with her parent embalmed in Myrrh resins and scented woods to be buried here in the lands of their origin at the Garden of Eden as encoded into her DNA and mind by God. The Image of a Phoenix bird from above. Yellow line is Tanzania / Kenya border. Anthropologic research into the Old Duvai Gorge known as our “Cradle of Mankind” will also reveal to us our oldest ancestral roots some 3 million years old and the lineage of MTDNA or Mitochondria DNA passed on through our Mothers that traces back here some 170,000 years ago as well as the DNA of our common Paternal Fathers some 50,000 years ago at the truer start of our Civilizations and the apex of our race types that were abundant throughout our entire Earth. 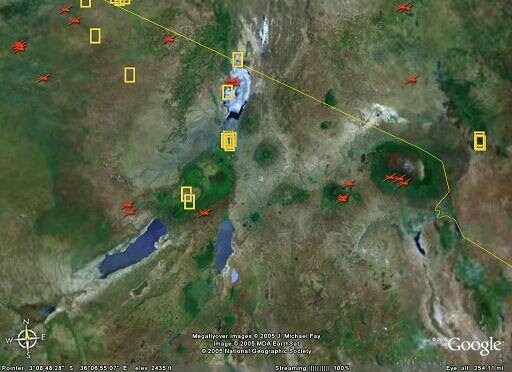 As we can also notice from the maps and the lakes that fill in areas of the Gorges in a circular pattern surrounding Lake Victoria in Tanzania which also houses 5 magical mountains that include the largest mountain in Africa, Mt KilimanJAro, it seems to reveal a once large Island of antiquity which also reflects the engravings of 5 mountains surrounding a concentric city reminiscent of Atlantis on the stone age artifact known to Archaeologists as a “frying pan” for baking bread and found in the Greek Cyclades Islands and dated to ca.2850.bC. The Garden of Eden is located just northerly of the Ngorongoro Crater in the naturally protected area of winding mountains known as the Olkarien Gorge, a name adapted from the Massai tribes for the Red Ochre mineral they use to paint their faces with. West of the Garden is the famous Serengeti Wildlife Park and East is Lake Natron a favorite breeding ground for Pink Flamingos and the Old Duvai Gorge. Lakes Eyasi and Manyara lie below the Ngorongoro Crater. Today the areas on the south side of the Ngorogoro Crater are still thriving lands used for farming. To further enhance this Great Mystery of our Garden of Eden, it is not only that we can establish my location for our Garden based on the Bible or Archaeology, but also and more importantly is that the Garden of it’s own accord reveals many wonderous “signs” from God hidden in her landscapes as these photos will reveal to you and also provide us with the secret of the Egyptian knowledge for the Eye of Ra. Ironically as you will see from the pictures below, not only does the Garden of Eden portray God’s words in the Bible but also the lands of Evil in Kenya’s Rift Valley as if some great Guru of antiquity was sitting atop of Mt KilimanJAro and writing the words that would be preserved by our later Scribes. 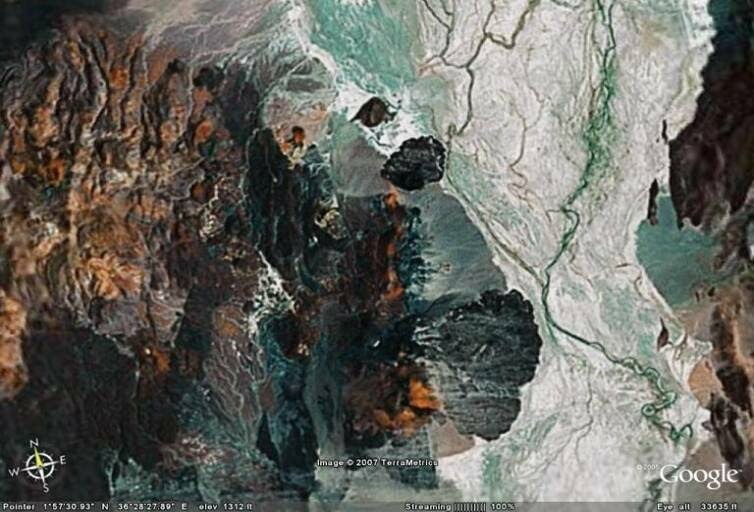 All photos are untouched other than to outline images and taken with the Google Earth Satellite program from 2005/2006. The latest Google Earth programs at this year of 2009.aD have been updated and some images may not appear as originally taken. These are the original images that provenance for me that this is in fact our True Garden of Avila in Eden. Especially since the image of my face as a child appears on The Babe in The Garden! 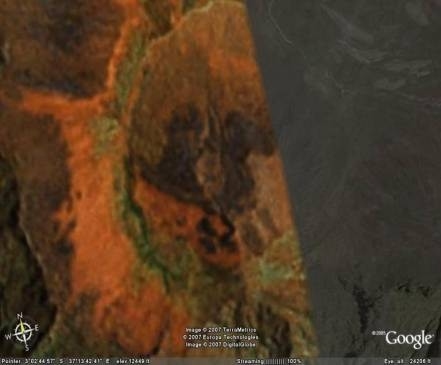 Olkarien Gorge Dove with a face image in the circle. Secret of The Eye of Ra as God’s Left Hand. A closer view of the Left Hand of God (Eye of Ra) reveals His image disguised in the Thumb as He Creates the Firstborn Son while The Holy Mother with Her Royal Diamond shaped Crown look upon the Babe with the image of my face as a child upon The Babe. Father Creates while Mother Nurtures. Pay attention to when I mention the word Soloeis. Watch what the Sun does. Garden of Avila in Eden decoded by Riven. 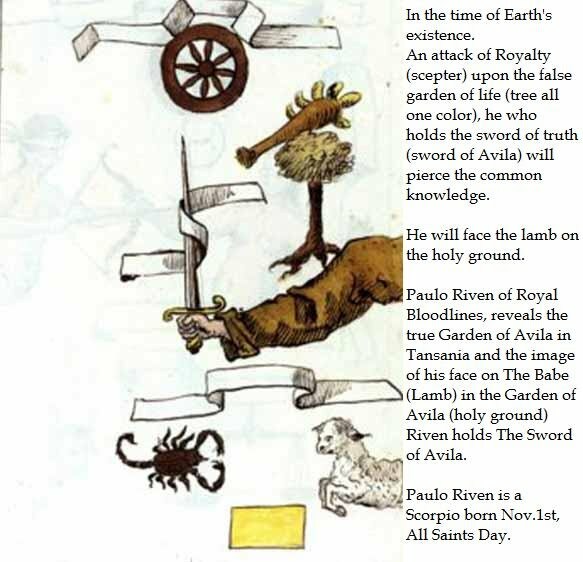 Signs that appear in the Garden are the Eye of Ra as God’s left hand and even looks more like an Eye and Eyebrow in this image, The Rib, An Apis Bull, A Serpent and Wizard with an Orb, Jesus’s face to the right with a head cloth and wounds. The line of a wall on the left side, image of an armored Knight at the Circle and the face of a Sleeping Giant just left of the circle and below the Serpent, which seems to rise out of his head. Some strange writings also seem to appear in light blue. If you still don’t believe that The Garden of Avila is in Tanzania, Africa, then perhaps as you know I have not altered a single pixel of the natural formations rather than to outline them or add tags, then perhaps you might ask yourself how can there be all these identifying markers or signs that portray the very words of our Holy Bible? All photos are unedited with the exception of saving them from the Google Earth Satellite program. You can see that these photos were untouched by using Google Earth to the co-ordinates at the bottom of the pictures and National Geographic headings yourself with Google Earth. 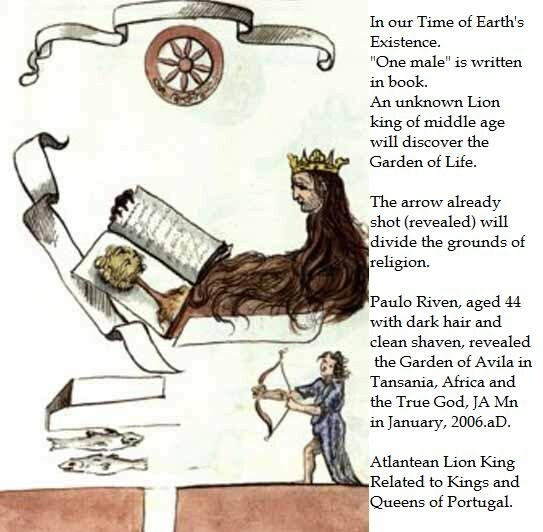 All images are contained in or around the Garden of Avila in Eden, Tanzania, Africa. Tanzania is famous for the much climbed Kilimanjaro, but a less well know and equally challenging mountain sits nearby. Kate Humble took a dizzying trek up magical mist covered Meru. “It’s easy to believe that Tanzania has only one mountain. Kilimanjaro is justifiably famous; at 5,895m, it’s not just the highest mountain in Africa, it is the tallest free standing mountain in the world. Better still, apart from calling for a good level of fitness, climbing it doesn’t require mountaineering skills. 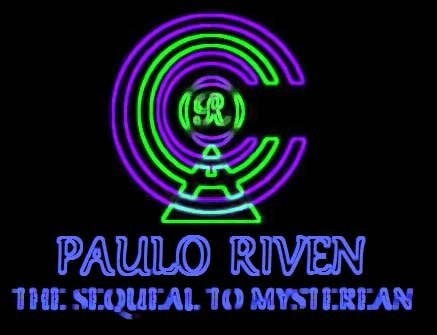 Lost Book of Nostradamus pages prophecizes Paulo Riven. 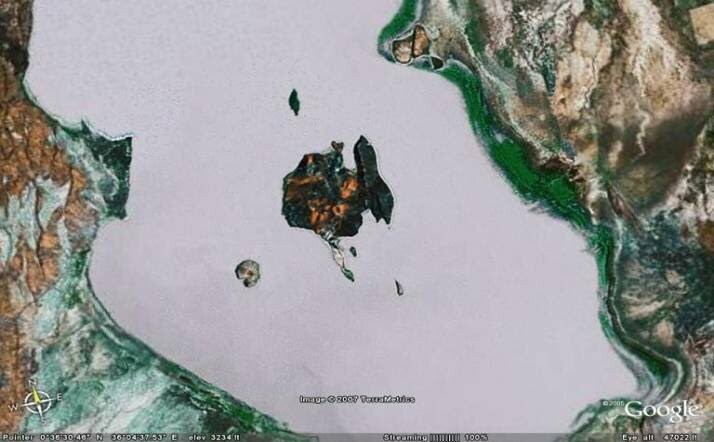 Caution; The following Google Earth images can be overwhelming for the elderly, overly religious or weak hearted people.- Riven. The Revelation of The Purification of Khem and The Garden of Evil In Kenya’s Rift Valley. Who was it that tempted us into great sins for our histories? Since we know that the Serpent tempted Eve in The Garden of Eden in The Bible causing the Fall of Adam, and that we also see the image of the Serpent and Sorcerer present at the Garden of Avila in Tanzania, then it only goes to figure that Evil must have been lurking nearby some where near The Garden of Avila in Eden. Now the Garden of Avila is nearer to the border of Kenya where the overhead image portrays the Ngorongoro region as a giant Phoenix bird with the tip of her wing laying across the border into Kenya, so as to injure it’s wing to say on the neighboring land of Mr.Zero in Kenya’s Rift Valley of Volcanoes and Blackened waters. South the little freak of a sorcerer headed towards The Garden of Avila to tempt Eve from the Garden’s of Evil in Kenya’s Rift Valley as the following images clearly reveal. To those Zero worshippers out there, I bring you your Evil Garden now destroyed along with your Mr.Zero beheaded and heartless by The Crooked Flaming Sword. In return, I have Sealed The Evil son you know as Zatan, Satan or Satiman eternally for you to witness, just as my Garden of Avila witnesses my Father and His Son that you tried to destroy to cattle the Umans of Earth into temptations and sins of taxes and money and corruptions of evil for your crooked dagger of deception. .111.Let no living thing, humankind, spiritual kind nor any gods of any kind unseal the Darkened Chasm where the 3 Headed Dragon with the Hearts of Znofheru, khufu and khafre are pitted and rotted. Where I have cast the Fallen Corpse of The Dark One.111. The Garden of Evil in Kenya’s Rift Valley begins about 266.66 miles from the Garden of Avila in Tanzania. When I began to look for the source of the Serpent and Sorcerer I came across this Obsidian pointer in Kenya that also resembles an Indian Chief’s Head with a feather facing North. Left to Right: YA-The Hermaphrodite Harlot, The Red Dragon and The Horned Asp. Back Row; Laughing Pig, Goat's Head(888),hidden daughter, cleaving son, Blue three eyed Reptillian Alien from Orion. Left bottom under yah, The WiZArd of the Orb and Massai Secrets of the Mandrake Mole in the Hole Fire ritual to summon the beast from Orion. the kings of the earth. All Son's of God JA MN are named JASA not jesus(he-ZeuZ). JA = God, SA = Son!!! Know This! 19:2. For true and just are his judgments, who hath judged the great harlot which corrupted the earth with her fornication and hath revenged the blood of his servants, at her hands. 19:3. And again they said: Alleluia. And her smoke ascendeth for ever and ever. 19:4. And the four and twenty ancients and the four living creatures fell down and adored God that sitteth upon the throne, saying: Amen. Alleluia. 19:5. And a voice came out from the throne, saying: Give praise to our God, all ye his servants: and you that fear him, little and great. 19:6. And I heard as it were the voice of a great multitude, and as the voice of many waters, and as the voice of great thunders, saying: Alleluia: for the Lord our God, the Almighty, hath reigned. 19:7. Let us be glad and rejoice and give glory to him. For the marriage of the Lamb is come: and his wife hath prepared herself. 19:8. And it is granted to her that she should clothe herself with fine linen, glittering and white. For the fine linen are the justifications of saints. 19:9. And he said to me: Write: Blessed are they that are called to the marriage supper of the Lamb. And he saith to me: These words of God are true. Temple that was moved from Saqqara, Egypt some 5,000 miles away to an island. This was where Snoferu and Khufu murdered God's Son prior to Jesus Christ by a satanic ritual of the crooked dagger through the heart upon the altar (Atar = heat,fire,desert,spiders,gold,arabians), on December the 10th at 8:08am, 3474.bC. Venus and Mercury formed the Bright star while the Crux is upside down and Jupiter was above in Draco. An identical formation of the Temple Serapaeum can be seen in Alexandria where the Pillar of Pompeii stands. Jesus was also a satanic ritual for the hebron dominion of satan. He died for their sins of murder not yours who are worthy of AMEN. 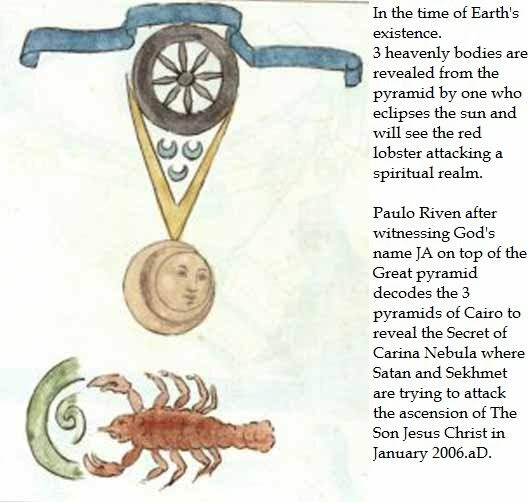 Notice the broken altar, the Son lying on it with a Sun symbol overhead. This was the missing Labyrinth Temple of Saqqara. On that very spot where JASA was murdered, today stands ironicaly a water tower! This was near the Atlantean Red Pyramid that was the Twin to the Great in Cairo. 19:12. And his eyes were as a flame of fire: and on his head were many diadems. And he had a name written, which no man knoweth but himself. 19:14. And the armies that are in heaven followed him on white horses, clothed in fine linen, white and clean. 19:15. And out of his mouth proceedeth a sharp two-edged sword, that with it he may strike the nations. And he shall rule them with a rod of iron: and he treadeth the winepress of the fierceness of the wrath of God the Almighty. 19:16. And he hath on his garment and on his thigh written: KING OF KINGS AND LORD OF LORDS. 19:18. That you may eat the flesh of kings and the flesh of tribunes and the flesh of mighty men and the flesh of horses and of them that sit on them: and the flesh of all freemen and bondmen and of little and of great. 19:19. And I saw the beast and the kings of the earth and their armies, gathered together to make war with him that sat upon the horse and with his army. 19:20. And the beast was taken, and with him the false prophet who wrought signs before him, wherewith he seduced them who received the character of the beast and who adored his image. These two were cast alive into the pool of fire burning with brimstone. Discovered by my decoding the Pyramids of Cairo, Egypt. 19:21. And the rest were slain by the sword of him that sitteth upon the horse, which proceedeth out of his mouth: and all the birds were filled with their flesh. The Dark One Fallen And BeHeaded by the Giant and the Crooked Flaming Sword. Large Dark Eye of satan's PHanes P-Hate-r-(Black Circle) looks to the Head of Zero. 20:1. And I saw an angel coming down from heaven, having the key of the bottomless pit and a great chain in his hand. The Dark One with it's OBsidian heart ripped out, wearing his black hat. The Brave Monk 's Face below. 20:3. And he cast him into the bottomless pit and shut him up and set a seal upon him, that he should no more seduce the nations till the thousand years be finished. And after that, he must be loosed a little time. The Pit of The Calling in Kenya's Rift Valley where the Rothchilds also have their Giraffe estate. It started falling on January the 12th, 2006.aD. Fireballs appeared over India afterwards. Future destiny of the Ash-Ke-Nazi (hebrew+german) Zionist World Order and their satanic followers in disguise of the New World Order and in actuality the Zionist Masonic Oligarchy. 20:5. The rest of the dead lived not, till the thousand years were finished. This is the first resurrection. Battles The Brave Angel of Light. Red Crater just left of Main Kiliminjaro Crater. The Two Headed Three Eyed Two Nosed Bearded Herder of Melkart Geryon's Cattle Carts For The Phoenician Pit. Ancient Cart ruts disappearing into the seas of Malta from the Phoenician expansions upon the Mediterranean ca.800.bC with their cries of satan's bowels of "thou shalt be put to death!". Thus the Dark Ages of Greece and their myths being stolen by the falsifiers of God in Phoenicia and Egypt! The Bible Chronology of Riven. Here's the problem with man's history according to The Bible. In the Bible, it took God 7 days to create the Earth, be they which eons you choose. But yet, it only took man 2 chapters from creation to Sin, and 5 chapters to DESTROY what God created. 2369 / 50 Chapters for Genesis = 47.38 years per chapter or 17,293.7 days. 6 days (chapters) would equal 284.28 years of Creation. 1 day = 47.38 years to rest and sanctify the Earth. 7 days = 331.66 Years for Gods works or 121,055.9 days. Chapter 1 - 47.38 years = 6 days of Creation. Chapter 2 - 47.38 years, but in this Chapter God rested for only 1 day...7.896 years + 47.38 = 55.276 years of God's Great Works. 2 = Man and Woman. Chapter 4, Man commits Murder, 189.52 years later. Chapter 7, The Deluge proclaims the Earth, 331.66 years after Creation. Chapter 8, The Earth is reborn, 379.04 years after Creation. So if we take my date of 6482.bC for that Battle of Neptunes Minions, that would mean that the Earth was created in 6813.66 bC, according to Theosophists and myself, which of course we could extend this slightly if we constitute each day as a Chapter of 47.38 years rather than 7.896 years from God's 6 days in Chapter 1. If we did that, then God would have just finished building the Earth, and like a child with resentment for his artwork, would crumple the paper right after...The only difference being that we would have to start Genesis off at Chapter 8 to reserve 7 Chapters for God's Works and Leisure. Let's look at the Chapters. 1074 Chapters x 47.38 years = 50,886.12 years for the Old testament. If we consider a Chapter a day, and a day was 7.896 years, then @ 1074 Chapters = 8,480.304 years. Less our 2005 years = 6475.3.bC. Not bad, a mere 8.7 years difference to my 6482.bC date. 3253.bC Flood of Noah copied from Xisuthrus ca.2000 bC Babylonian record, Egyptian Flood of Hathor. .........Egyptian "Legend of the Destruction of Mankind". Eye of Ra. 2886.bC Abram leaves for Chanaan at 75 yoa. 2861.bC Isaac born to Sara at 90, Abram 100 yoa. 2824.bC Sara dies at 127 yoa. Buried in Fields of Ephron. 2801.bC Twins Jacob and Esau born to Rebecca, Isaac 60 yoa. 2786.bC Abraham dies at 175 yoa.Buried in Fields of Ephron. 2747.bC Jacob marries Rachel after 14 years service to Laban. .........and 1 daughter to Isaac after 20 yrs service to Laban in Haran. 2738.bC Ismael dies at 137 yoa.Buried in Fields of Ephron. 2737.bC Rachel gives birth to Joseph. 2721.bC Joseph sold to Egyptians at 16 yoa. .........Marries Aseneth,daughter of Petephres,Priest of Heliopolis. 2681.bC Isaac dies at 180 yoa.Buried in Fields of Ephron. 2671.bC Jacob reunites with Joseph in Egypt at 130 yoa. 2654.bC Jacob blesses his 12 sons and dies at 147 yoa. .........Joseph leaves with Chariots and horsemen to bury his father in Ephron's field. 2627.bC Joseph dies at 110 yoa.Buried in Fields of Ephron. 2531.bC Exodus 430 yrs after Abraham. .........Philitis The Shepherd (JASA = "God's Son" cf:Palermo stone), prophecy of thrice born son not of the blood of Khufu to rule Egypt. 2482.bC Tabernacle of the Exodus built 145 yrs after Joseph's death. Both Joseph's story in the Bible and Djoser share a 7 year famine,dream and consulting a prophet. Noe (Noah) 600 yrs old and Sem 100 when flood occurs. 2 years after flood Arphaxad born to Sem. From Abraham to Exodus 430 years. Manasse and Ephraim born to Aseneth,Joseph's wife. Total = ____2242 Septuagint years to Flood. *2 years after Flood Sem is in reality 102 years old. Abraham_____________2010.bC__1172 Septuagint years from Flood to Abraham's birth. Abraham in Egypt____1935.bC__@ 75 years of age left for Chanaan and Egypt.Pharaoh Senusret I Kheperkare(c.1962-1917). Joseph @ 30_________1767.bC__Pharaoh Amenemhet V Sekhemkare? The common notion that I read was that the Exodus occured in the time of Ramses II,Meriamen Usermaatre Setepenre (c.1279-1212). Supposing a date of 1250 for the Exodus plus 96 years to Joseph's death and 626 years more to the flood would equal 1972.bC for the flood. As noticed above with the genealogy from Adam to Joseph and according to the 2350.bC hebrew masoretic date for the flood,the exodus would have to be around 1639.bC to Pharaoh Neferhotep II. Septuagint genealogical dates versus the Masoretic Hebrew dates. to 3250.bC since we know that it was 292 years from Abraham to the flood according to the Masoretic dates. and end all thine Strife. To Shield my cherished Son this night. this Sacred Child's Chalice of Souls. to carry this Son of Mine. on this glorious Earth below? Alas it is a Shadow of The Sun. Creator Dragons of Spirit by Riven. nary an Atom to dismiss. a mere touch upon her head. for the Children she seeds. in the dark of coolest breeze. a dance of love, passion and embrace. The cry of her newborn infant Galaxy. The Secret of The "Crux" of Carina Nebula. Let me now try to explain for Scholars and Stephen Hawkings, the purpose of the "Crux" or "Cross of Humankind". Very much so, Riven's condensed version of Timaeus. never ending spirals upon her masts. to collide mid center and spread her wings divine. too crowded for laughter, they spew out their vent. around their Corona, so pleasing to the eye. Reborn from the Father, to this Majestic new Galaxy. till Angel hairs spin, their thrones to retire. Tis Truth, this wonder of The Spiral. Riven- 7:22 AM 1/14/2006 (8488.aJa). Keep track of time and your fellow humans. The 9 by the 1 to make a 10...see? 9 is Encoded into Everything. Son of Papa JA MN.